Posts have been lacking on the blog for a while now. The reason being is that my family has been growing pretty rapidly over the last few years. I feel like I just wrote this post when we had our second daughter. Now my wife and I just had our third daughter! So it’s without saying that our hands have been pretty full lately! Now, we planned pretty well this time for when we had our daughter to have enough food in the house for easy meals but family wanted to help out in providing food for us, specifically my Mom. My Mom wanted to help us out someway by providing food and making our hands less full. So recently I’ve been considering subscription models for meat or vegetables – but all those still required cooking, which was what I was trying to avoid for the past month or so while we were trying to figure out how to feed 3 kids and ourselves! So my wife brought up maybe having my Mom put money towards Freshly. I immediately went over to their site to check out their meals and how they worked. Turns out the price is pretty reasonable if you have a coupon code and the ingredients are pretty spot on for accommodating our primal meal tastes. Now I will get into later how these aren’t exactly Primal compliant but the alternative was us going out to eat or picking up something else with worse ingredients – and one can only eat so much Chipotle or In N Out protein style burgers before going insane. It’s all about balance. 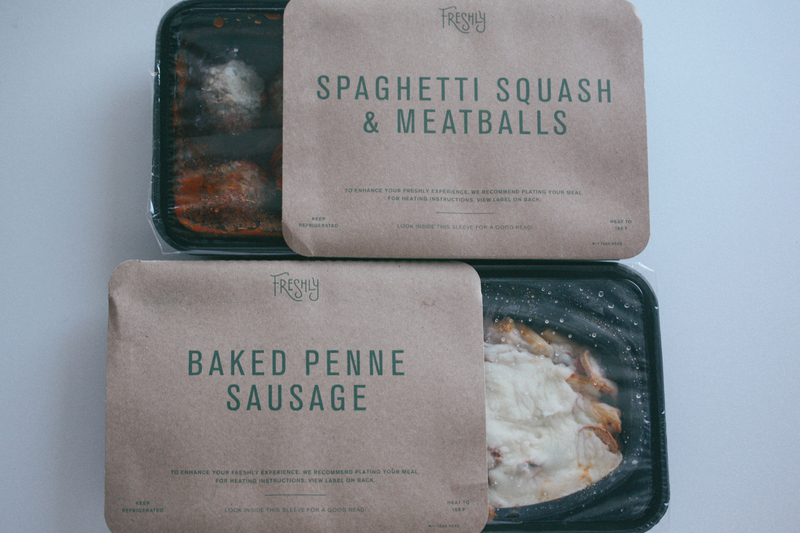 You choose your meals from Freshly’s constantly rotating weekly menu of over 30 different gluten-free options. Freshly cooks and delivers all of your meals that are prepared and cooked by Freshly chefs and delivered fresh – never frozen. 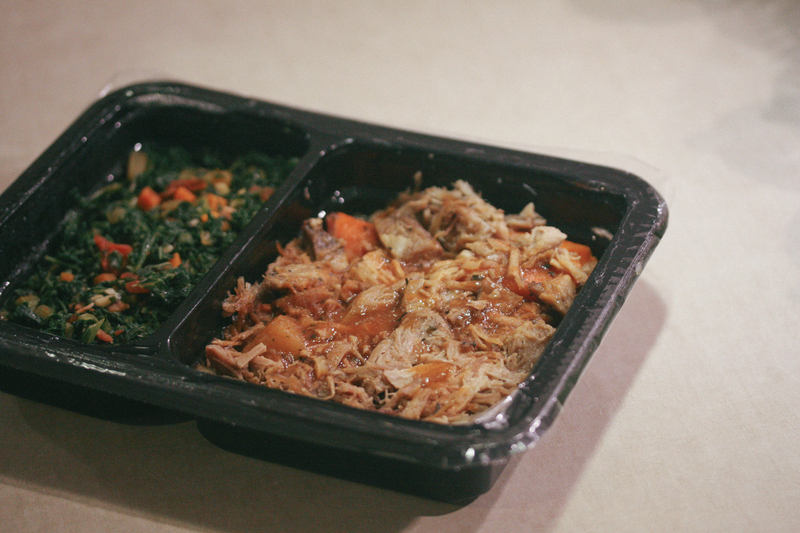 Then you enjoy the fully prepared, healthy meals that are ready in under 3 minutes. The only thing you need to do is enjoy. 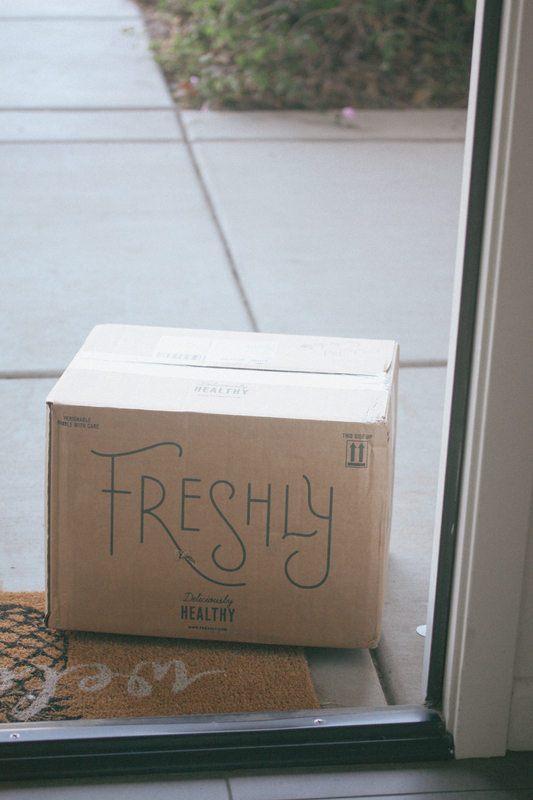 So I still want to treat this like a product review because that’s what Freshly is – a product. That means I want to look at the three typical categories: Nutritional Profile, Affordability and Taste. 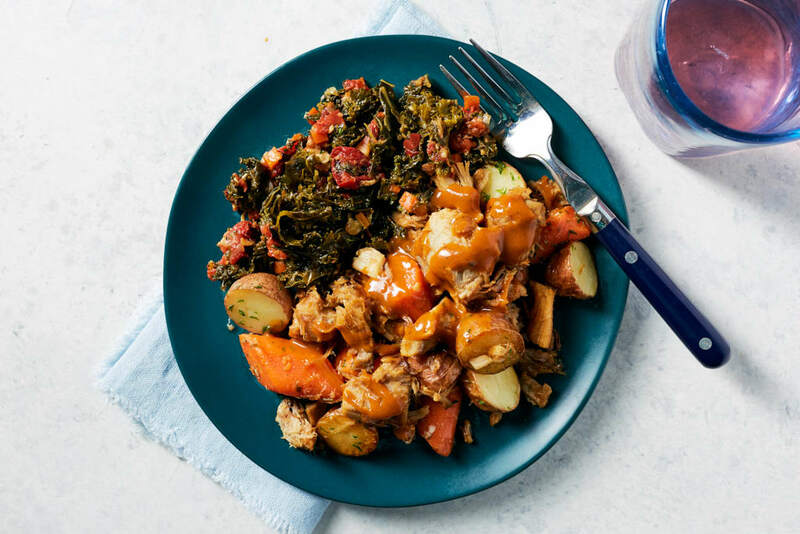 Ingredients: Pork (Pork, Pork Glace (Water, Pork Bones, Carrots, Celery, Onions, Tomato Paste, Spices) Sea Salt, Black Pepper), Carrots, Potatoes, Kale, Tomatoes (Tomatoes, Tomato Juice, Salt, Calcium Chloride, Citric Acid), Water, Onion, Expeller Pressed Canola Oil, Chablis, Chicken Stock (Chicken Broth, Natural Flavors, Mirepoix Stock (Carrot, Onion and Celery Juices), Gelatin, White Wine), Celery, Tomato Paste (Tomatoes, Citric Acid), Garlic, Bacon (Pork, Water, Salt, Sugar, Celery Powder, Natural Flavor), Chicken Fat, Cassava Flour, Sea Salt, Spices, Rice Flour, Nutritional Yeast. Looking at the listing of this meal on their site they also have these cool little icons that indicate that the meal is: Low Carb, High Protein, Gluten Free, Dairy Free and Soy Free (and occasionally they’ll have some meals listed as Paleo). This one probably isn’t indicated as “Paleo” because it has potatoes in it, even though Potatoes are pretty much Paleo and Whole30 now adays. Now a quick breeze over all these ingredients in this meal look pretty spot on and honestly this meal is near perfect. I could virtually live off of these meals indefinitely if I could afford it consistently. However there is one main ingredient in pretty much every one of their meals, including the ones labeled as Paleo. What ingredient is that: Expeller Pressed Canola Oil. Apart from this one ingredient these meals are perfectly primal and paleo. What’s wrong with canola oil you ask? Well I could write a whole post on it but I’d rather just have you read this article and this article and this article. The gist of it is that it’s a highly processed oil derived from rapeseed that goes through a bunch of weird processes like being degummed, bleached and deodorized. You can watch the process of it in this youtube video. Ok but that’s what’s wrong with regular canola oil, but these meals contain expeller pressed canola oil. What’s the difference? Well expeller pressed means it doesn’t go through all those weird chemical processes, it’s just pressed (put simply). But that doesn’t change the fact that this oil is high in “heart healthy (omega–6) fats” aka polyunsaturated fats, which means it’s more susceptible to oxidation than say saturated fat. That’s why saturated fat is good for you because it has less of an opportunity to oxidize – saturated fat is more stable. Ok but what does that mean for these meals and why am I still eating them you ask? Because. Everything else about these meals is perfect and a little expeller pressed canola oil is better than the alternative. It’s a worthy trade off for the convenience. The alternative is that I go out to eat Chipotle or In N out or … Pizza Hut. 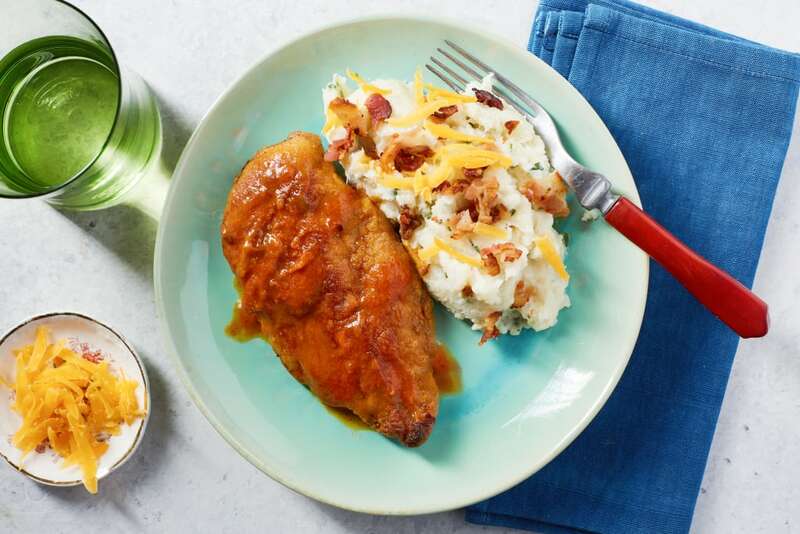 Seriously, a little canola oil in these meals won’t kill me – I have more of a chance of dying in a car accident than a little canola oil in these amazing convenient tasty meals. However, if someone at Freshly is reading this please take this to heart: please stop using canola oil and switch to something more healthy like olive oil, coconut oil, avocado oil, lard, tallow or red palm oil. The rest of their meals vary in carb/fat/protein content slightly but you can just find the meal that fits your macro goals. You’re able to select what your restrictions are and they will tell you what meals fit within your restrictions. All their meals are gluten free, but say you don’t like turkey (which my wife and I don’t) you can tell them that and they will indicate which meals have turkey in them. Figuring out how much these cost is kind of weird because there are always promotions and deals. 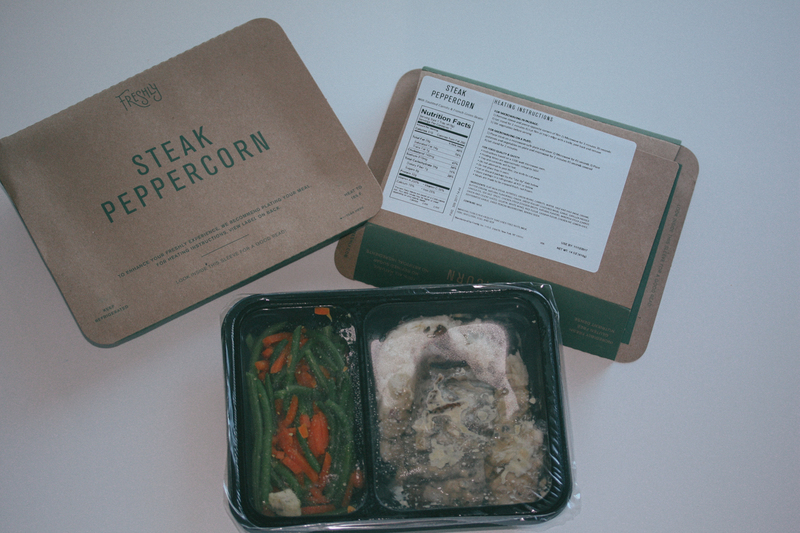 Like this one if you sign up with our referral link you can get 6 dinners for $39. Their standard prices can be found here and for the sake of this review I’ll review their standard prices since there are always promotions and it would be too hard to rate them off their promo price. 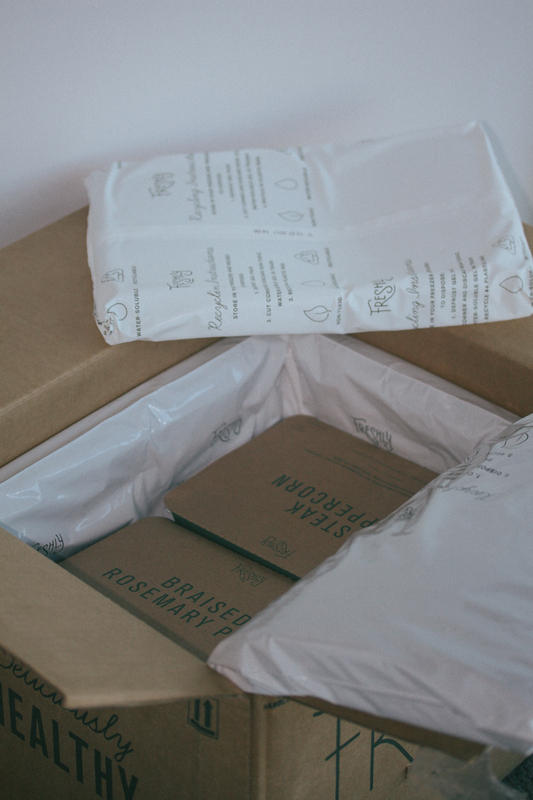 All the meals include free shipping so you don’t have to worry about that. So how do these stack up? You’re obviously paying for convenience – and in this season of our lives with a newborn and 2 other kids we needed the convince. Let’s take the 6 meals a week plan and compare because that’s the plan my wife and I use. 6 meals a week worked out for us because we do a bible study throughout the week where each one of us is left home with the kids for one night by ourselves so having this on those nights is especially helpful. That’s where 2 meals are used (4 for both of us) then the other 2 are eaten on Thursday or we freeze them for another day (you can freeze them and they will reheat just as well, you just have to add an extra minute). Then typically we make food or go out to eat the other times. Fridays or the weekends we like to make ribs or some other thing on the BBQ. Just a note, we don’t feed our kids these meals, it’s just enough portion size for us to eat and we normally feed them leftover meat, berries and pouches. Compare $9.99 a meal to going out to eat. You can get a pizza for $10 and feed the whole family sure. But a better comparison would be to the alternative that we would eat if we didn’t have these meals. If we didn’t get a chance to cook and we needed something primal and fast we would go to the standard Paleo option: Chipotle. So how does my typical Chipotle order stack up against a $9.99 meal from Freshly? 2x Carnitas ($2.70 extra), White Rice, No Beans, Guacamole, Fresh Tomato Salsa, Sour Cream, Fajita Veggies, Cheese and Romaine Lettuce. You could even take away the double meat and it would still come out to $10.34. Therefore I really think Freshly at their standard price of $9.99 a meal is a great deal. It’s good food with a great amount of convenience. Sure you could bust out a super cheap dinner for your family with some roasted veggies and carnitas or something – or heck even make a homemade chipotle bowl yourself and I’m sure it would come out cheaper that $9.99 (only by a little) – but that’s not convenient. I think $9.99 a meal is a great price for their convince of just having to warm them up and then sitting down and eating a meal in less than 5 minutes. Normally when you think of pre-made meals it conjures up ideas of gross frozen meals and lean cuisines – but know that Freshly is fresh not frozen and their not tasteless/saltless like the majority of precooked meals out there. 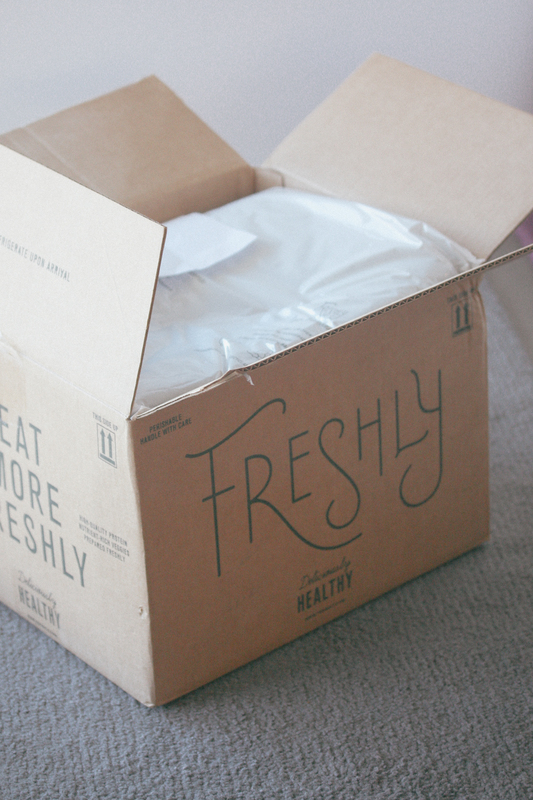 My wife and I have tried several meals from Freshly now and to be honest all of them taste great! Let’s take a look at a few meals I’ve eaten and how they taste. Like I said this one is my favorite and the one I continue to order each week. The kale is steamed with some sort or tomatoes and bacon and such and it really makes a steamed leafy green approachable if you don’t normally eat them. The pork is hearty and full of flavor and goes great with the little bit of potatoes and carrots. This one was probably my least favorite. Normally I love spaghetti squash as a replacement for noodles. Even more than julienned zucchini as I’ve written about here. But this meal was my least favorite because I wish there was more sauce. There was only a little amount of sauce with this dish, almost like it was a mistake. 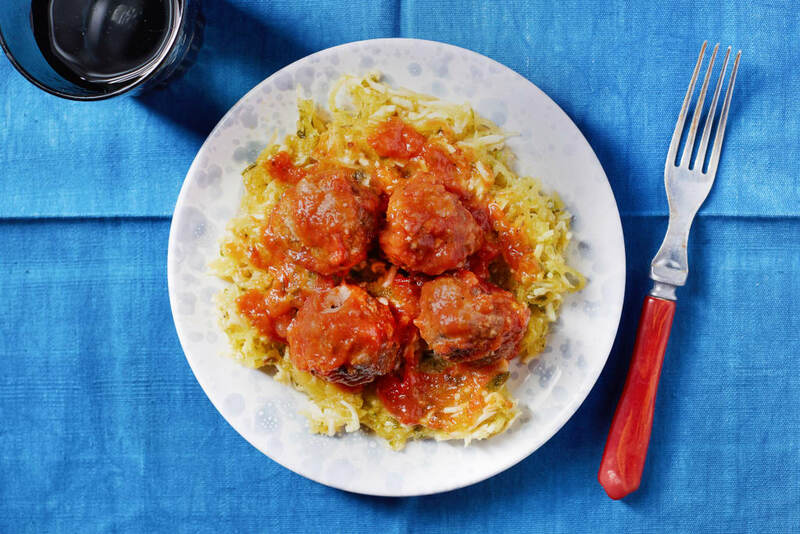 The meatballs were great and gluten free – which normally doesn’t happen often. All together everything tasted great, I just with there was a little more sauce or maybe I just eat really large portion sizes normally. This one was really cool to try, the flavor was really good with the buffalo sauce. The mashed cauliflower was amazing (if you do dairy, as there was a little dairy in the mixture I think). The only negative on this one for me was the gluten free breaded chicken – because you’re microwaving these and essentially steaming them, you can’t ever get a crispy texture on breading. So while the chicken was good, the breading texture wasn’t great. First off, thank you Mom for buying these for us! They most definitely came in handy when we needed them most and they fit our dietary restrictions (aside from the canola oil) and most importantly – they tasted great! We liked them so much that after my Mom gifted these to us, we’re still buying them ourselves to have on hand while my wife and I are in this busy season of our lives. It’s nice to have the convenience for a few days out of the week. As I pointed out earlier as well, if someone at Freshly is reading this please take this to heart: please stop using canola oil and switch to something more healthy like olive oil, coconut oil, avocado oil, lard, tallow or red palm oil. I suggest everyone try them out even if you’re slightly intrigued and needing the convenience. Like I said if you sign up with our referral link you can get 6 dinners for $39. Check it out and let me know what you think. Thanks for reading! This entry was posted in Product Reviews and tagged family, freshly, frozen, paleo, precooked meals, primal, reviews, subscription. Bookmark the permalink.